Via Brownstoner, the Department of Transportation is building out a nice street redesign project in Brooklyn right now as a part of its Ft. Greene Bike Lane & Traffic Calming Project (download a project description here). Formerly a 70-foot-wide one-way street, Carlton Avenue, above, has been converted to two-way operation with five-foot bike lanes on either side. DOT is now building a 20-foot wide planted median in the middle. 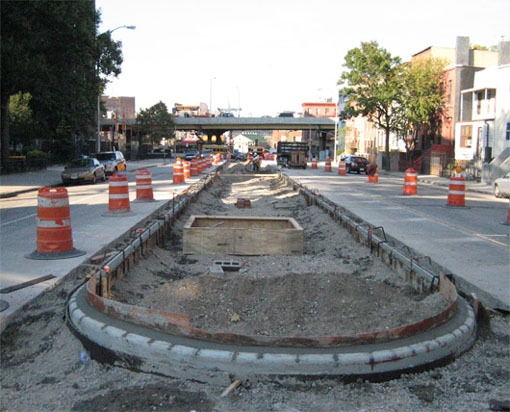 The Carlton Ave. improvements are similar to recent projects on Park Slope’s 9th Street and Vanderbilt Ave. in Prospect Heights. and NYC Parks Department (Parks). and Parks will maintain it. have a mid-block break to allow cars to make a U-turn. In a memorable meeting last June, Brooklyn’s Community Board 2 rejected DOT’s "complete street" plan in a 16-15 vote. CB2 member Anthony Ibelli said the neighborhood didn’t need any bike lanes because cyclists are "thugs on two wheels." Other Community Board members argued that narrowing the 70-foot-wide one-way street would create traffic back-ups and bottlenecks. Quotes like that prove that CB’s are manned only by New York City’s best and brightest! Weinshall haters take note. This worthy project was planned and funded before the current green regime took the reins at DOT. Yeah, yeah, Iris for Mayor. A hundred years from now she’ll surely be judged as the greatest DOT commish ever. Could Mr. Ibelli-cose actually have said “hugs on wheels?” I imagine not. Not a crumb of credit? Such bitterness blinds the eye. No, no, she deserves the credit for planning this. Good for her. I’m just saying that we shouldn’t get carried away. Let’s remember that the Weinshall-led DOT wanted to run a couple of one-way speedways on 6th and 7th Avenues through Park Slope, among other things. creditor, i salute your desire to be fair & balanced. however, it is worth pointing out, then, that the project did not include the green planted median under iris – that component was added personally by janette. Iris deserves absolutely no credit for this great project. All of these projects were planned and implemented by a special staff member at the Brooklyn Borough Commissioner’s office called the Downtown Brooklyn Transportation Coordinator (or something like that). This staffer was hired as part of the Downtown Brooklyn Traffic Calming Project. That project was initiated and driven forward by community members back in 1997 or so (search around TA’s web site). For YEARS, Iris’s traffic engineer-run DOT dragged their feet and did whatever they could to squash the Traffic Calming Project. On top of all that, I’m pretty certain that the Downtown Brooklyn Transportation Coordinator is paid for with EDC funds or some other source. DOT wasn’t even writing his checks. If Iris cared, if she was paying attention — if she deserved credit — this specific project would have been completed five years ago. It is a sick joke to say that Iris deserves credit for this project. We are only just now beginning to understand just how far back we fell during her administration. For me, the green median is what makes the project . . . so the credit goes to Sadik-Khan. Come on: have you EVER seen a department do a 180 (for the better) like the transition from Iris to Janette? It’s like someone waved a magic wand over the DOT and turned lead into gold. As I heard, Commissioner Sadik-Kahn herself went on a bike ride with some DOT staff and personally felt propelled to see to it that this planted median would become a priority, and it has. So if DOT did a 180 with a new commissioner, what does this say for Bloomberg? He was asleep at the wheel (so to speak) for 6 years and suddenly had an epiphany? And what if Weinshall had left DOT sooner – she was looking for a new job for at least a couple of years. Who would have become the commissioner? Horodniceanu? Primeggia? I’ve heard that JSK was almost chosen as DOT commissioner at the start of the first Bberg Admin but for obvious political reasons, and because she was a decent administrator who had somewhat fixed up a broken agency, Chuck’s wife was kept on. But Iris had no vision or awareness of what the potential was for her role. I’m sure that if JSK were there, particularly during the planning of the 2012 Olympics, there would have been enough internally driven advocacy and outstanding planning that we would have seen a lot of these good projects happening quite a few years ago despite the fact that the mayor wasn’t all that interested until very recently. The neighborhoods around downtown Brooklyn started calling for traffic calming around 1996. Along with the neighborhood associations, and TA, Konheim and Ketcham deserve credit for focusing community concerns on real solutions. It’s great to see their efforts finally bearing fruit in 2007. One lesson is that some of the seeds planted now will not be harvested for years. The capital budget process is slow and it takes persistence to win changes to the physical city. That’s why efforts like Upper West Side Renaissance, Safe Routs to School and Safe Routes to Seniors are so important. They provide a structure for fundamental change. Incidentally, don’t forget that overcoming 9/11 took immense bureaucratic and psychological energy that, regardless of DOT commissioners, set back livable streets efforts. I’m greatful that DOT is led by a transportation reformer, and hope this window of opportunity is not dashed by some catastrophe or crises. New Bike Plan for Ft. Greene and Prospect Hts.